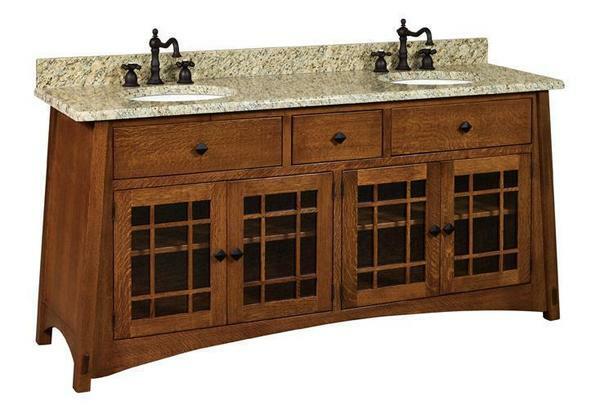 Get the large Amish 72" McCoy Double Vanity Cabinet to complete your master bathroom! This solid wood heirloom quality vanity cabinet will provide you with two sinks and a beautiful solid surface or granite top. You have many options available with this handcrafted bathroom vanity! Choose your favorite wood and finish, select your favorite hardware, add on a granite countertop and more with this highly customizable Amish vanity cabinet! If you have any questions about this bathroom vanity, please call 866-272-6773 to get in touch with one of our Amish Furniture Professionals today! Thank you for shopping with DutchCrafters! All Faucet Holes are Drilled 8" on Center. Others Available for Custom Charge.